There are other options you can pass in here, if you choose to do so, and there are plenty of them to find on the dsh man page. For now, we are going to accept the defaults and have a look at the next file, /etc/dsh/machines.list (for Debian). The syntax here is pretty easy. All one has to do is to enter in a machine’s credentials (Hostname, IP Address, or FQDN) one per line. 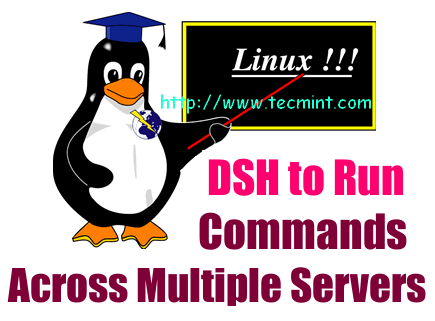 DSH can also be configured with groups of machines in the “/etc/dsh/groups/” file, where is a file with a list of machines in the same format as the “/etc/dsh/machines.list” file. When running dsh on a group, specify the groupname after the “-g” option. Rob is an avid user of Linux and Open Source Software, with over 15 years experience in the tech geek universe. Aside from experimenting with the many flavors of Linux, he enjoys working with BSDs, Solaris, and OS X. He currently works as an Independent IT Contractor. The -c command does not mean “command to be executed”. According to the manual, it means “concurrent shell”. If you have 1000 servers, It will ask 1000 times to put yes/no to known hosts and for first time to add ssh-key again it will ask 1000 times for password, then what is the use of this??? Well if you set config for ssh to auto accept new known_hosts and establish pre-shared ssh keys then there’s no prompting at all! and then connect to your thousand servers.